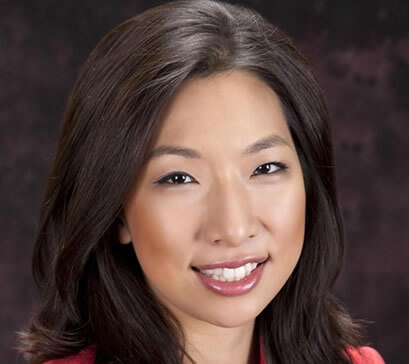 Christine Kim is an Emmy award winning reporter who joined the News 3 team in October 2012. She anchors the weekend morning newscasts on News 3 Live at Sunrise at 6 a.m. and News 3 Live Today at 9 a.m.
She is excited to call Las Vegas home and comes to the desert heat from the arctic cold. She worked as the weekend anchor and nightside reporter at KTUU-TV in Anchorage, Alaska. In her 3 years at Alaska’s top station, she won numerous awards for the stories she’s covered, and boosted ratings for her weekend shows. She’s talked to bear mauling survivors, she’s done stories about the challenges of education in rural Alaska, and covered one of the most devastating ice-jam floods along the Kuskokwim River. One of her stories, about a retired local couple who built a “Radio Flyer red wagon” using the base of a pick-up truck, exceeded the company’s record web hits with more than 15 million hits, worldwide. Christine loves a good story, and she says she’s looking forward to telling and sharing the stories of Nevadans. Before joining KTUU, Christine worked as the morning news reporter at WICD in Champaign, Illinois. She also interned at Fox Chicago News where she field produced and contributed to the web department. She graduated from the University of Illinois at Urbana-Champaign with a bachelor’s degree in Broadcast Journalism. Born in the city of Chicago, raised in the suburbs, she’s excited to experience all that Las Vegas has to offer. When she’s not working, you can find her at local coffee shops and restaurants; she’s always looking for great local spots. Christine’s also fluent in Korean, and she can’t live without Korean food!